It’s easy to come up with a list of cultural Byron Bay activities. The difficulty lies in restricting it to just five – such is the diverse number of them in this holiday region which for decades now has boasted a legacy of arts and culture. From painting to film, music festivals, and cooking classes, the Byron Bay area offers interests and past times which are sure to appeal to the majority of our guests. And who’s to say you can’t practice your new found skills, back at Broken Head Holiday Park? With our caravan park facilities you can cook up a storm on the barbeque or get creative with some sand art on the beach. If you’re feeling a bit stiff because you’ve been spending too much time at a desk in front of the computer (and, let’s face it, who doesn’t these days?) then a spot of Classical Ballet, Hip Hop, Top or Contemporary Music Theatre may be just the job to loosen up those joints. Dance Dynamics, which has been around for more than 14 years now, offers dance skills for beginners as well as would-be professionals and caters for all ages from three years upwards. It focuses on self-expression as well as moves. A similar philosophy is adopted by Funky Moves which also offers core strength classes with the ubiquitous fit balls. The school also specialises in Acro training which is all about gaining visible height through learning to flip, turn and twist with the aid of a mini tramp and (you’ll be glad to hear) a crash mat for safe landings! For a bit of fun and exhibitionism, The Cassettes offer Flashmob classes at the Kulcha Jam Dance Studio in Byron Bay. It’s all about the 80s so if that was your favourite decade you’ll love showing off these steps to the music and hits of your youth. Fancy yourself a bit of a Picasso? Or maybe renaissance art is more your scene? Whatever your particular art crush Byron Bay Centre for Visual Arts promises to nourish it with a series of day and evening classes for all ages. Techniques include oils, water colours and sketching. For those who fancy trying their hand at some creative art but don’t fancy straightforward painting then there’s also photography, clay making and a rather innovative mixed media class. Anna Heggie is also keen to help holiday makers release their inner artist at her art workshops in Lennox Head during a series of morning classes. Ron Curran does the same with his pupils at his Dynamic Drawing classes in Byron Bay Scout Hall every Friday morning. Any self-respecting guide to Byron Bay activities involving culture will always include music amongst the top five. The town’s Great Northern Hotel and Beach Hotel regularly host a variety of singers and musicians and often with no admission charge. You’ll also find free live gigs at the Railway Friendly Bar most week nights. Then there is the East Coast Blues Fest, of course. This is one of Australia’s largest Blues festivals – which pulls in crowds of more than 17,000 – and takes place every Easter without fail over a period of five lovely long days. It’s held on Tyagarah Tea Tree Farm, located just a five minute drive north of the town of Byron Bay. Who has appeared at the Festival in the past? Well, none other than the great Iggy Pop, Ben Harper and Chris Issak. If your holiday happens to be in the winter months then don’t worry – you can still get your fill of the Byron Bay festival music scene with the incredibly popular Splendour in the Grass three day festival at the end of July. More for the younger crowd, this modern day Woodstock comprises a series of stages blasting out tunes from a variety of different genres. Lovers of the celluloid screen and red carpet can look forward to spending ten days immersed in their favourite creative art at the Byron Bay International Film Festival during February and March. This fantastic family Byron Bay activities event complete with beach screenings and children’s showings is now in its ninth year and 2015 is set to bring holiday makers, directors, actors and musicians from around the globe as in previous years. It’s inspiring, thought provoking but most of all – fun for all ages. Byron Bay is well known for its sea food of course, but there’s much more to food here than just that. While you’re camping in Byron Bay take classes Cooking in Bangalow with Cec Young for instance and you’ll learn how to make meals with snapper fillets, spaghetti and chicken breasts coated in dijonaise sauce with olives. Nadine Abensur meanwhile will whet your appetite when it comes to vegetarian fare with an emphasis on Asian, Middle Eastern and Modern Australian tastes. Bangalow Cooking School promises a gourmet feast with hands-on two hour long cooking classes for groups of up to 12 individuals. Founder Leah Roland, who has both Greek and Lebanese roots, is a chef and cooking presenter who has run cooking programmes at the world famous Buttery drug and rehab centre as well as managing a catering company in Sydney. Come and stay at our Byron Bay caravan park and get cultured! As we mentioned at the beginning of this article the above five examples are just a sample of a huge selection of diverse cultural Byron Bay activities to engage in. If there’s a particular event you’re keen on attending, such as a music festival, be sure to book tickets well in advance of your Byron holiday so you don’t miss out. 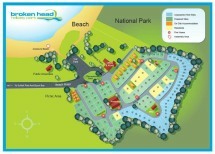 It’s a good idea to browse our caravan and camping accommodation and book your stay at Broken Head Holiday Park at the same time, so you know you’ll have somewhere to stay when you get here.